iPad app enabling crop consultants to gather data in the field and share it in the cloud. For more than a decade, FieldX Inc.® developed and sold a desktop based application that was used by agronomists to record crop observations. Growers, applicators, and other agronomists all needed access to the information but sharing options were limited. FieldX® needed to streamline their service so users could effortlessly enter and share information. The new solution had to be secure while allowing people with different access levels to collaborate on observations with a particular grower and their third party vendors. It also had to allow data entry while offline, since internet isn’t always reliable in the fields. RoleModel collaborated with FieldX to develop the FieldX Journal™ iPad® application for data collection in the field, and the cloud-based FieldVault® system for secure data transfer, storage, and sharing. RoleModel's designers and developers worked closely with the FieldX team to understand how each user group would enter and use crop data. We determined that a set of Application Programming Interfaces (APIs) was needed. This approach allowed FieldX customers to conveniently capture data through the iPad application while in the field. RoleModel designed and developed a brand new, native iPad application. We evaluated the data entry workflow from the original desktop application and identified the core components. Then, we incorporated many of the existing data entry features into the new application. This approach provided a smooth transition for existing users while making the application more usable in the field. We rapidly prototyped a streamlined user experience. The new designs helped FieldX prioritize the features they wanted in the first release. 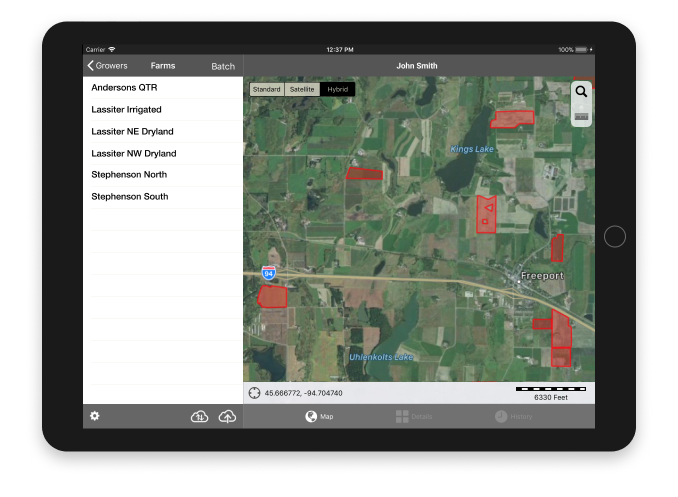 After working with the prototypes, the iPad app was enhanced to provide options for crop consultants to tailor the app to meet their unique data entry needs. The new FieldX suite of applications is easier to use, saves time in the data collection process, and improves access to shared information. RoleModel also evaluated the FieldX data management and sharing process. We incorporated existing user permissions and roles into a new cloud-based application. We wrote an API to handle secure data transfers between the FieldX Journal iPad app, FieldX Office™, PC app, and the FieldVault. With this architecture in place, we were also able to extend the API so developers and other third-party companies could easily retrieve and store related information within the vault. The new FieldX suite of applications is easier to use, saves time in the data collection process, and improves access to shared information. Customers now have a modern and sophisticated mobile app experience to customize their personal experience and manage their data. FieldX’s centralized information storage solution is positioned to meet the needs of the changing agricultural industry that is quickly moving toward collaborative mobile experiences. With new data input and exchange technologies, FieldX is now positioned to work within the IoT (Internet of Things) - an important part of their long-term strategy to change the agricultural industry.